2 April 2019 – This step isn’t valid anymore. We made it easier for you to embed a donation button now. We auto-generate code for your donate buttons, so you can paste the HTML code into your website. The button will be displayed and link directly to your donation page. 1. Go to your Donorbox dashboard and click “Donate button” by the appropriate campaign. 2. Scroll past the CSS Code to find the “PNG Image Buttons”. You can choose the size and color of your button, as well as set the option for recurring donations as default. Once you’ve customized your donate button, download the PNG by clicking on it. 3. Now, to add your donation button to a MailChimp email campaign, create your campaign and click the “Image” button in your text editor. Other email campaign software such as Campaign Monitor will work in a similar fashion. 4. Upload your donation button PNG and link it to your Donorbox campaign link. 5. That’s it! 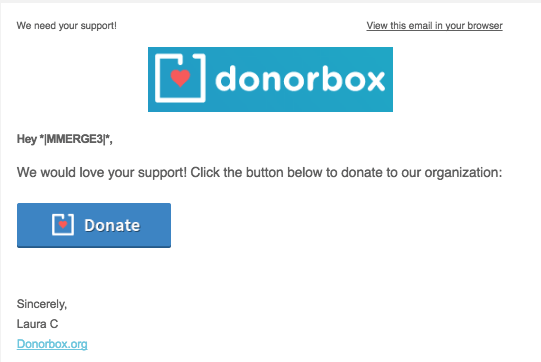 You are now ready to send your email campaign, complete with a donation button.